The soup can is one of the most iconic piece of packaging from the last 100 years, popularized through Andy Warhol’s pop art interpretation in the 1960s. 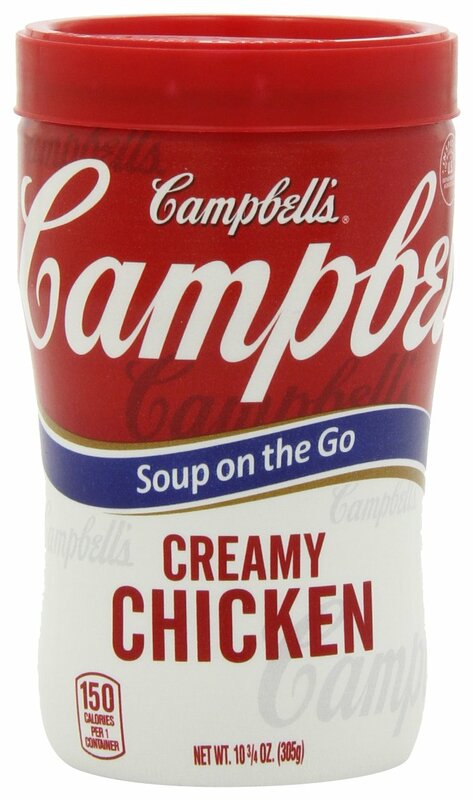 In honor of the 50 year anniversary, which occurred last year in 2012, Campbell’s released a limited edition version of their classic soup in a specialty label. Campbell’s has been making canned soup since the 1870s, and in recent years, have become well-known for pushing the packaging innovation envelope for their products. Other companies over the years have provided soup in cardboard cartons with a snap-close spout, but there has been no real innovation that introduced new usage occasions until the last ten years. Targeting the teen market, the microwavable, ready-to-eat cup of soup, “Soup On the Go” (Originally introduced as “Soup at Hand”) was introduced to the marketing in 2003 and is now available in all their classic flavors like Tomato, Chicken and Stars, and New England Clam Chowder. “Soup on the Go -Our heat-and-go cups let you enjoy delicious sippable soups–anywhere, anytime.” says the Campbell’s website. The microwavable cup concept was also extended to their “Chunky” line of soups for heartier “M’m M’m Good to Go” bowl convenience. Then in August 2012 Campbell’s launched Campbell’s GO! – well-known to the packaging world as the soup-in-a-pouch. A microwaveable pouch with cool finger-touch-points, the brand introduced six new unique flavors to the market: Creamy Red Pepper with Smoked Gouda, Coconut Curry, and Moroccan Style Chicken, to name a few, were all created to target the Millennial generation. Most recently, in September 2013, the brand announced they would be launching Campbell’s Soup in K-Cups – “Campbell’s Fresh Brewed Soup” – utilizing the popular single-serve, single-touch Keurig Coffee machine to facilitate an easy just-add-water lunch option. “Snacking is a growing behavior among U.S. consumers, with more than half snacking multiple times a day. Consumers are also looking for snacks that serve as mini-meals to satisfy hunger, and there is an increasing need for ultra convenient options. Campbell’s Fresh-Brewed Soup was designed to meet that consumer need,” said the company in a press release announcing the product. Earlier this year the company announced they would be released 200 new products in 2014. They’ve already managed to free soup from the microwave with their new Fresh Brewed Soup concept, where will they go next?